It’s been a long, hard week and you want nothing more than to grab a “Cheeseburger in Paradise,” a margarita or two and find a place to kick back and escape everyday life. Enter Bossier City, Louisiana’s Margaritaville Resort, the brainchild of musician Jimmy Buffet. One of several Buffet-owned properties, this location offers guests a “license to chill,” but its previous website wasn’t fully maximizing visitors’ ability to get their relaxation on. With our redesign, Noble Studios specifically sought opportunities to boost traffic, increase digital presence and brand awareness while making it much easier to navigate. 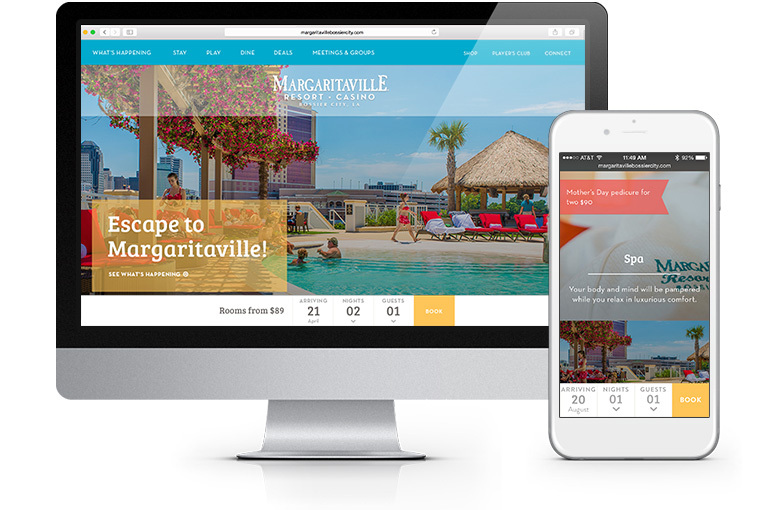 By improving navigation and enhancing its booking widget, Margaritaville would be able to drive not only web visitors, but also real-world visits to the resort. 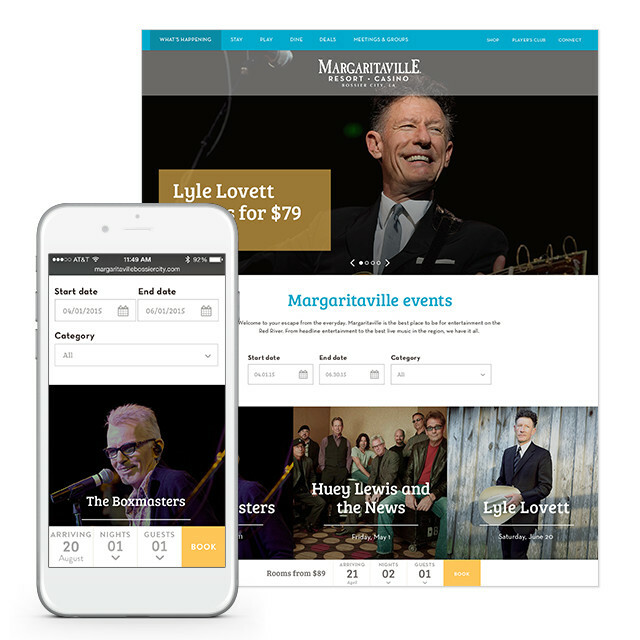 Because Margaritaville’s mobile users outnumber its desktop visitors two to one, Noble’s team first recognized the need to make the site mobile-friendly. 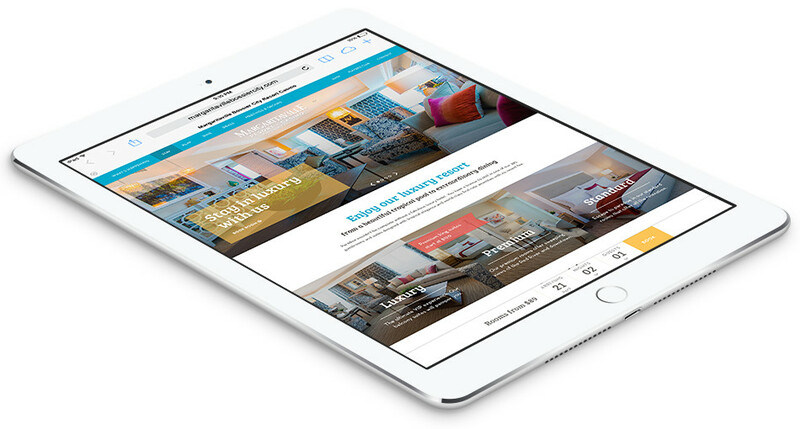 The new site is responsive across all device types while retaining a fully interactive experience. Visually, the Noble team sought to showcase bright, fresh and large inviting photos of the property and amenities, allowing visitors to picture themselves enjoying the Margaritaville life. The relaxed, playful look and feel blends classy with clean, while setting the Bossier City destination apart from the others. A new feature allows visitors to toggle between various restaurant menus on searchable pages that are optimized for SEO. Previously, the menus were static PDFs. Headers are anchored to prevent unnecessary scrolling, proving especially useful for hungry, on-property visitors who can quickly access restaurant menus from their mobile devices. Reserving one of the property’s luxurious rooms is now a snap, too. A new booking widget is anchored to the bottom of all screens, providing easy, one-step room searches. The widget also remains in place on mobile, helping to increase room bookings by being ever-present. As for things to do during your stay, a revamped entertainment and promotion calendar presents an improvement over its predecessor by allowing visitors to filter events only taking place during their trip. Simply plug in a start and end date, and you’re presented with a variety of choices from headlining acts to dining deals and special events. 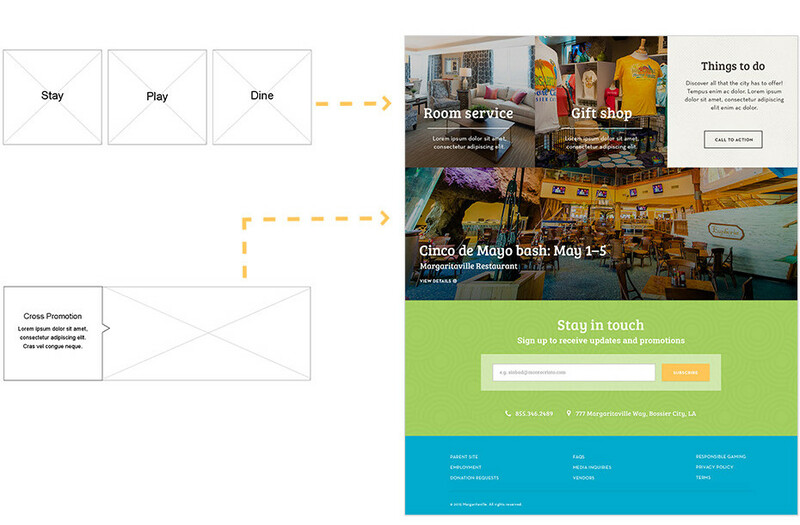 A new layout allows the client to build their own custom pages with modular components, moving content – including text and images – in and out of pages as they see fit. With these added features, the new site gives Margaritaville full control over both its content and its message, helping spread the word about the Parrothead lifestyle to potential visitors from across the globe. Year over year, the average session duration has increased by 10% and number of keywords ranked on page 1 on the Google search results are up 33 percent. Website bounce rate is also down 10 Year over Year.